The ChaosUT2 package comes in two forms, the first and simplest form is the .UT2MOD format. To install ChaosUT2 using this method, just double click on the .UT2MOD file and follow the instructions. NOTE: What is a .UT2MOD? Well, for the most part, it’s a windows install file that is controlled by the setup program in your UT2003\System directory. It is by far the easiest method to use. However, there may be some people who have problems with this method for various reasons, and so a few of these are covered in the next section. The second method for installing ChaosUT2 is via a .ZIP file containing all the files necessary to use ChaosUT2, but with instructions for manually placing them where they need to go. This is one solution for those who cannot use the .UT2MOD format for whatever reason, but is a bit more time consuming and can cause problems if the instructions are not followed correctly. Sometimes however, there is a problem when folks double click the .UT2MOD, and a window then opens up, asking which program should be used to run the UT2MOD. This is a known issue with UT/UT2, and is NOT caused by Chaos. But if this happens to you, go to this location and follow the instructions. If you experience a problem that is not covered here, then E-mail us, or post on our forums, with as many details as possible, including any error messages you encounter (write them down please) and we will try to help you. Step 3: Open the Chaosut2 folder on your desktop. Simply drag and drop the contents of the chaos folders to their matching “package contents” folders. 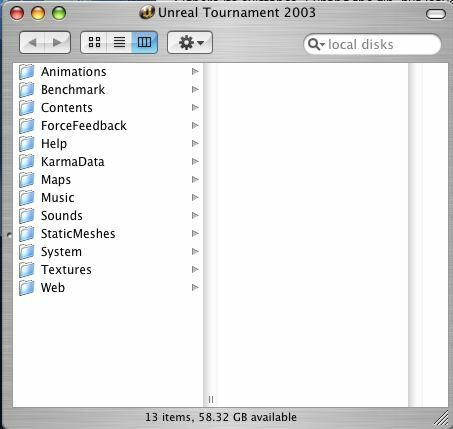 For example, open the animations folder from your download, highlight all of the files in there, and drag & drop them on the animations folder in the unreal tournament package. Step 4: Close the package contents, and run the game.